Studies performed by the Ponemon Institute linked 56-59% of security breaches to third parties. At the same time, companies are increasingly leveraging specialty service providers to perform critical business functions. Combined, third-party risk is being elevated to the board level and banks are scrambling to manage their vendor-related risks. The net result for service providers is a barrage of ill-fitting vendor due diligence questionnaires, certification requirements, audits, and contractual clauses aimed at transferring the risk from the bank to you, the service provider. 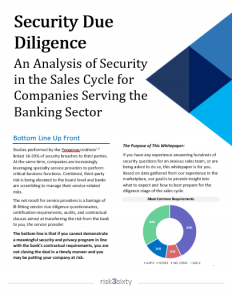 The bottom line is that if you cannot demonstrate a meaningful security and privacy program in line with the bank’s contractual requirements, you are not closing the deal in a timely manner and you may be putting your company at risk. This entry was posted in Cyber Risk Management, Whitepapers and tagged Cybersecurity, Vendor Management, whitepapers. Bookmark the permalink.